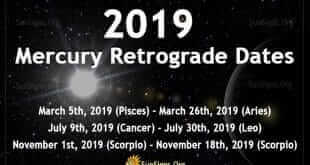 Mercury retrograde dates for 2019 - 2020. If you are looking for a Mercury herb to plant in your hedge witch garden, consider dill. Mercury is the planet of communication. You will be curious, about the world and the people in it, when Mercury is in the 12 houses. As energetic as you are, Mercury in the 1st house makes you restless and distracted. With Mercury in the 2nd house you spend a lot of time studying. With Mercury in the 3rd house, your curiosity drives you to add to your wealth of knowledge. With Mercury in the 4th house, you focus on comfort and your family. With Mercury in the 5th house you use your creativity when communicating with other people. When it comes to communication, Mercury in the 6th house can be a little confused. There’s nothing better than a lively debate, especially with Mercury in the 7th house. With Mercury in the 8th house, it’s all about strategy. With Mercury in the 9th house you can’t help but want to be free to search for answers. With Mercury in the 10th house, you have a knack for looking at the situation and figuring out the most efficient way to get it done and done right. Mercury in the 11th house means you try to convey your intentions in the best light possible. Mercury in the 12th house often has trouble focusing on important details.